X3 Ultra Stainless is a line of specially manufactured stainless self drilling fasteners featuring high hardness, high anti corrosion properties and better drilling capacity. 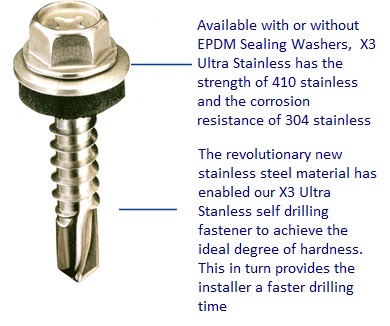 Our X3 Stainless Self drilling fasteners have incredibly strong corrosion resistance without surface plating or coating. And having weathered a series of strict salt spray and sulphur dioxide tests with amazing resilience, their strong corrosion resistance has what it takes to provide the buildings of today with the safety and long lasting durability to last well into tomorrow.